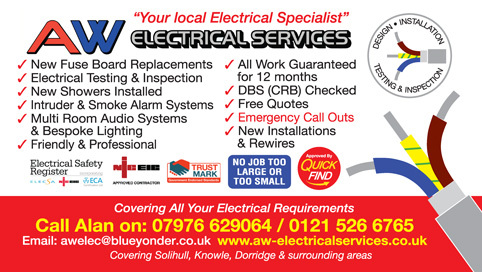 AW Electrical Services are a Quick find Directories vetted and recommended, Trust Mark approved, Elecsa and NICEIC registered local electrician in Solihull, Castle Bromwich, Sutton Coldfield, Lichfield, Tamworth and surrounding areas. "Alan was extremely helpful during the call-out and even spoke to various people on the phone for me to explain my situation. He came round within 24 hours of me getting in touch and went above and beyond what was expected. I'm pleased to have booked his services for next week and I'm confident he will do a great job." "Alan provides a very professional, helpful and efficient service, including explaining any details necessary, even for a fairly small job"
"Had problem with wall socket in kitchen. Had already been let down from two electricians, so was very pleased with Alan's positive and quick response. He was able to come that same morning and arrived within 2 hours of my call. He is very professional, tidy and friendly and the work was carried out in no time at all. Would have no hesitation in recommending him." "Alan is a lucky find! He was prompt, polite, professional and personable. Can’t fault him and will never approach another electrician again. Highly recommended." "I had an emergency with all my garage & Utility sockets tripping & not resetting. I needed someone fast but my previous electrician had retired. I looked in Quickfind found AW & called Alan. He had just had a job cancelled so he was with me in less than an hour. It ended up as a pain of a job as Alan had to diligently trace the fault around the ring main. All sorted in the end and gave me some most appreciated guidance. Top quality professional work, but what makes Alan stand out for me is that he is such a polite & thoroughly personable guy ! For sure he is now my first call for any electrical work. Top Professional !" "Very professional & attention to detail very high. I was very happy with the service." "I contacted Alan as I could smell burning and my smoke alarm was going off, he left the job he was on and came straight to see me - absolutely superb service." "Hello Sandra, sorry to hear about your emergency, very pleased that Alan was able to help you." "Alan does a great job. He's incredibly helpful and friendly and takes a lot of care with what he's doing. Alan has put in a whole new alarm for me. I would highly recommend him." "Highly recommended. When I next need electrical work I will immediately reach for the AW Electrical Services number." "Have used Alan on two occasions now; he is always on time and carries out the work in a professional manner. First class electrician - 5 stars. Thanks." "Allan from AW electrical services was excellent, very friendly and efficient, I would highly recommend him." "Alan fixed a shower for me last week. Everything Alan did was professional and explained thoroughly before and after he did the work. Alan was thorough and tested everything he did and explained the tests as he did them. He even did work that I wasn't expecting him to do such as trunking the wiring into the fusebox. Alan's work is neat and tidy and he treats your home with total respect. He didn't leave until he had cleaned thoroughly and asked me if everything was ok. It was almost 4 pm and he had another job to go to but he didn't rush and I felt 100% satisfied with the work he did. I would have no hesitation in recommending Alan to anyone requiring an Electrician. Thanks Alan"
"I have found Alan and Elliot very kind and helpful, sorting me out with some very awkward problems, quickly on the ball,cant rate them high enough"
"I called AW electrical after the terrible electrical thunder storms on the 13th September as I had lost power in my house, Alan came out immediately, even though it was 9pm at night. Can't rate him highly enough." "very good service, came out in an emergency. would recommend." "I can highly recommend AW Electrical Services. An excellent service provided by an absolute gentleman who was prompt and courteous for the whole of the job. I received an honest and full explanation of the problem and my issue was resolved with electricity fully restored after a short time. I really do wish all tradesmen had the same genuine qualities as Alan and I will call him in the future if I am ever in need of an electrician again -thank you !" "I kept the Quickfind Directory for my late father's property,as I don't live locally, and used it to find a really helpful and friendly electricianAlan Webb of A W Electrical Services. Who I needed to call out on a bank holiday. I shall certainly be using him again." "Alan is a very helpful, reliable and professional person. He explains very thing that he is doing, especially when he finds something that needs to be replaced. He didn't leave the job until I was satisfied that all was working correctly." "Resolved an emergency. Highly recommended." "AW Electrical Services have always offered a first class service with attention to detail and a courteous and clear method of communicating any issues. General Manager, Boundary Mill Stores"
"I had a new fuse board fitted, I cannot speak highly enough of AW Electrical Services professionalism and competence along with excellent customer service, the job was done and dusted in no time." "I called as I could see the electrician was qualified and also local. I hoped he could come quickly, I am so glad that i did call... Alan was friendly, polite and was very professional. We needed a new light fitting as it turns out the existing one was in poor condition and if left would have been potentially dangerous. Alan quickly made us safe for the night. I asked him if he could come back the next day and refit another light and he said he would. His rices were fair and I'm so glad he came on tat night. I was so happy with the service and would not hesitate to recommend Alan to anyone who needs an electrician." "I called out Alan as both my smoke alarms wasn't working. I had very good service, he came when I called and replaced the alarms for me. I would always recommend them every time." "Called AW Electrcal Services as an emergency and Alan arrived within the time he had said. He was polite and thorough and explained to me exactly what the problem was and what he needed to do to put it right. He worked quickly and efficiently keeping me informed at every stage of the process. I was very happy with the way he worked and his attitude to the job. Will definitely have him again and highly recommend him." "Rewiring carried out by AW Electrical Services. We received excellent workmanship with little or no damage to existing decor. Considering we have two flat roof extensions this proved to be quite a challenge. Everywhere left clean and tidy when work was completed thank you." "I was pleased with the response from Alan when our electricity went off. Very Professional at each stage of the job. I was happy with the outcome." "Alan was very helpful and explained everything he was doing, he was very genuine and I would recommend him to anyone needing electrical work." "We called Alan on News Year day and he came out within the hour. He initially tried to help us over the phone to save our expense on a bank holiday. However we needed Alan to come out to the house to resolve our problem. He was extremely friendly, polite and professional. He quickly found the fault and clearly explained the problem to us. He completed the repair restored our electricity much to our delight. we highly recommend Alan and we will be using his services again." "I had my house fully rewired work was carried out well ,and the house was left clean and tidy. I would highly recommend him."